Personal Capital is one of my all-time favorite resources, it has been very helpful in my wealth building, and the best part is, it’s free! Personal Capital is an intuitive interface to work with. After you complete the simple sign-up process, you are prompted to add your financial accounts, which sounds sketchy, but because of their extensive security measures and your ROI from using the platform, it’s well worth it. When you finish adding your accounts, PC will have read-only access to your accounts and can lay out your finances like you’ve never seen before. You will have a birdseye view as to where your money is going, your spending trends, your investment fees, investment returns, and your net worth. Here are some more in-depth reasons why I love Personal Capital. The Overview– here you will get a snapshot of all your accounts, net worth, cash flow, and current spending according to your budget. 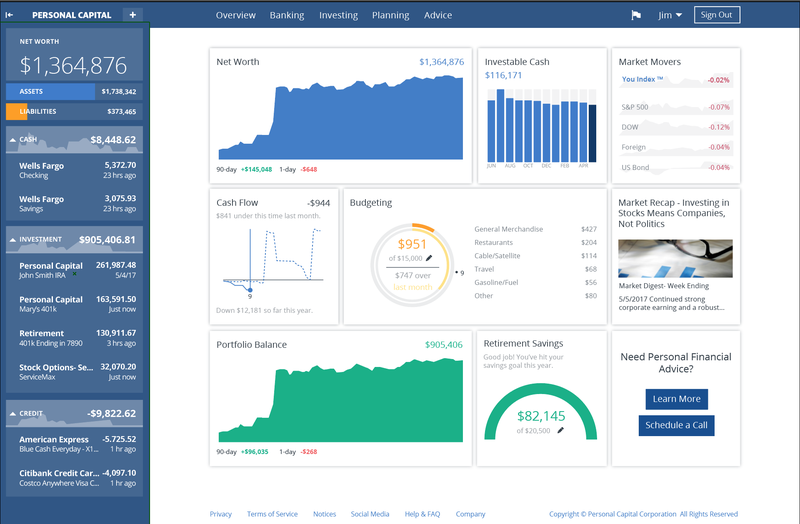 The Retirement Planner– have you ever wondered how your current investments, future income, and future savings will set you up for retirement? Well here is the solution. Since Personal Capital can see what you have in your investment accounts it can run a Monte Carlo Simulation based on your exact holdings and what assumptions you have for your future earnings/savings. You’ll get great insights as to how you’re doing based on your investment goals. Cash Flow Dashboard– if you don’t have great cash flow, then you are in trouble. This simple interface will keep you on top of what’s coming in vs. what’s leaving your wallet. It will help you to quickly identify any problem spending categories. You can’t improve what you don’t track, and thanks to PC, tracking doesn’t have to be difficult. Investment Fee Analyser– have you ever wondered how high your fees are for your investment accounts vs. how high they should be? Once again it’s PC to the rescue. This feature alone may earn you tens of thousands of dollars over the course of your life, this alone is worth taking the plunge with PC. Those are a few of my favorite features that Personal Capital has to offer. Hopefully, I pushed you over the edge into trying this amazing, free resource.